Pancit palabok is my favorite Filipino noodle snack. I first got to taste this dish at Jollibee when they first introduced it in their menu and from that point, I fell in love with this dish. I just love its mixture of flavor with the savory taste from the pork cracklings to the pungent flavor of the tinapa or smoked fish and of course, the shrimps that comes with it. To balance everything off, a good drizzle of calamansi juice is a must. Pancit palabok has thick orange sauce made up of shrimp broth or meat broth with toppings of shrimps, adobong pusit or squids, egg, Chinese cabbage, pork cracklings or chicharon and shredded tinapa or smoked fish. Basically, you can add anything as long as it compliments the flavor. Then, to balance everything and like almost all of the pancit dishes, calamansi juice is drizzle onto it. 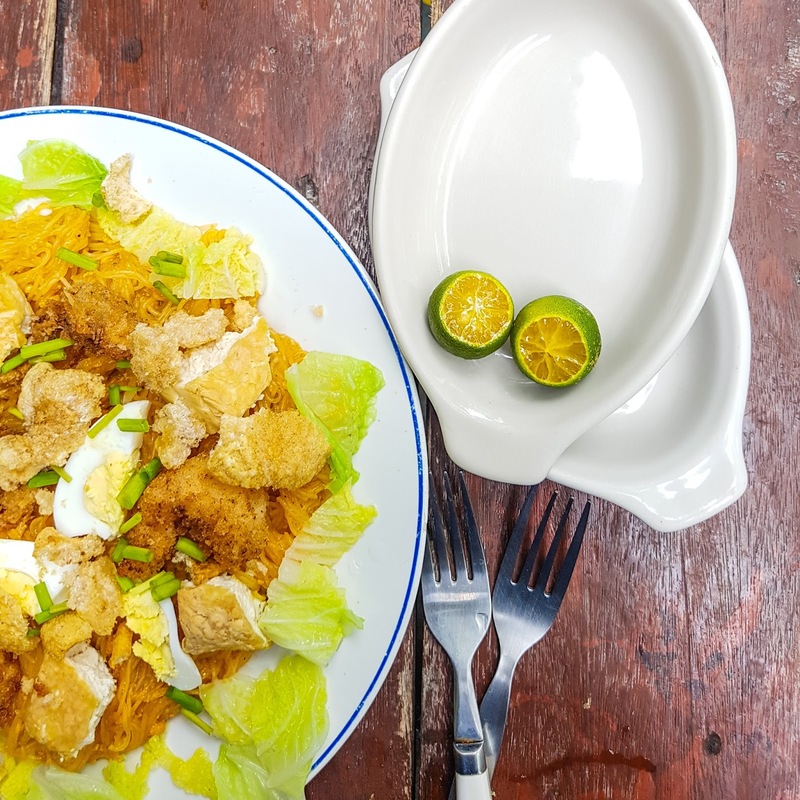 While I love the usual pancit palabok, I’m thinking of a new way to better enjoy it. Then, I thought of deep fried calamari and shrimps and thought of why not deep fried the shrimps and squids instead of the usual adobo and boiled shrimps. Then, I realized I still have a jar of aligue and decided to add it in the dish. This made the palabok sauce more flavorful. Cook rice noodle according to package direction. Drain and set a side. Reserve the shrimps’ head and shell. Crush and extract the juice until you get a cup. You may add water to aid in extracting the broth. Strain and reserve. In a wok, combine ground beef and water. Boil and simmer slowly until the water dries out and the fat from the beef comes out. Saute until golden brown. Add cooking oil if the beef fat is not enough. Saute garlic and onion. Add aligue and saute for another 3 minutes. Add water, shrimp broth and beef cube. Boil and simmer for 10 minutes. Combine glutinous rice powder and water. Add into the sauce to thicken. Combine the achuette seed and hot water and stand for 5 minutes. Strain and gradually add the achuette liquid until desired color is achieve. Add tinapa powder and mix. Add more to suite your taste. Season with salt and pepper. You still have your chicharon so just season it lightly. Season the squids and shrimps with salt and pepper and marinate for 30 minutes. Strain to remove excess liquid. Beat the eggs and milk together. Drench the shrimps and squids into the conrnstarch seasoned with salt and pepper. Dip one by one into the egg and milk mixture. Drenched into the panko and deep fry until golden brown. Roughly around 3 minutes per batch. Combine the rice noodle and pancit palabok sauce. Topped with the deep fried squid and shrimp and garnish with onion chive, chicharon, Chinese cabbage, sliced eggs and fried tofu. Serve with calamansi on the side.